Do you travel at night? Do you need some help in focusing? Do you suffer from negative emotions like fear or anxiety? Then, by all means, get yourself some Onyx. Featuring a hardness of 7 on the Mohs scale, Onyx is solid black or banded Chalcedony (a form of quartz). Its name comes from the Greek word for fingernail, apparently a reference to a legend in which Eros cut the nails of Aphrodite, and the gods turned the clippings into stone. Ancient Greeks and Romans carved Onyx into cameos. Today, it’s cut into cabochons and beads for use in bracelets, necklaces, rings, and earrings. It can be found throughout the world, including the U.S.
Onyx is thought to help wounds heal and to benefit skin, hair, and nails. It’s said to enhance memory retention, increase persistence, and promote follow-through. Healers say it helps focus and guide the will, soothe nervousness and stress, and even rebuild vitality after a period of illness. 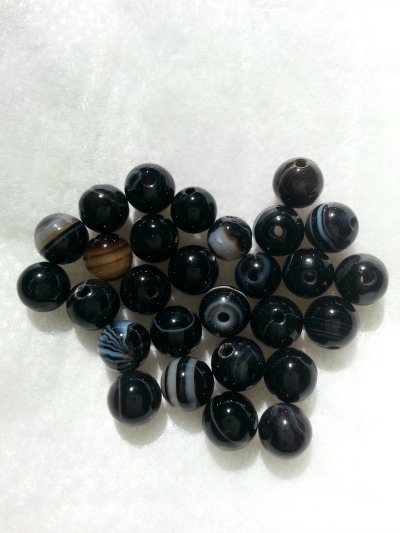 Round, 6 mm Onyx beads. Look at all the variety in shading! Attuned to the root chakra, Onyx is associated with the planet Saturn. 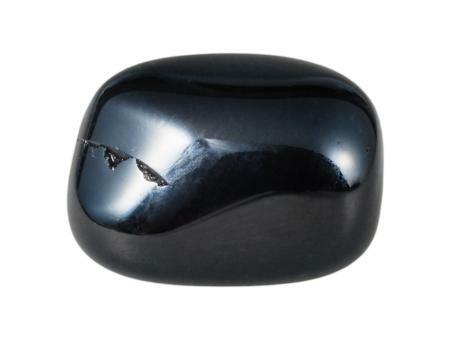 Feng Shui experts say Onyx helps attract financial gains. Onyx can be worn in jewelry as an everyday form of healing. Additionally, a chunk of it can be placed nearby when you work (maybe a paperweight?) or held in your hands while meditating. Clean it by simply wiping it with a moist cloth, as ultrasonic cleaners could seep chemicals into the porous stone and cause discoloration. This entry was posted in Sunday's Gem and tagged black gemstones, healing gemstones, onyx, properties of onyx. Bookmark the permalink. I have a bracelet of onyx stones that I find powerful in its ability to ward off negative energy from others. I wear it on days when I know I’ll be around the public….for that 10% who can otherwise take 90% of your good feelings. That and my determination to guard my energy field work together. I love the quote from Einstein. It seems the more someone studies science and the cosmos – the more spiritual they become at their core. Miracles, indeed, are a part of our world and experience. Love this, Barb — “that 10% who can otherwise take 90% of your good feelings.” We must be running in similar circles. On the next nice stormy day, I’m going to make myself an onyx bracelet and test out the hypothesis myself! Anything that can help us feel more positive can’t be all bad, right?! I am really enjoying your Sunday Gems! Thank you, Suzi. You probably already know all this stuff, but I’m enjoying doing the research. And having it all handy in one place appeals to me! Black onyx is always mysterious. Thanks, Debbie. I think the black stones are mysterious, too. And very powerful. I have a black coral that I love…however, I don’t love its setting. Maybe one day I’ll have it reset so I can wear it again. This is a little off topic — and perhaps a little “off” — but that first pic of the chunk of onyx looks like the shift lever on my cousin’s car, after his dog chewed it up. It’s a beautiful stone, for sure. Just like pearls complement a little black dress. an onyx necklace looks great on a white summer dress. Add black patent leather strappy sandals, and you’re good to go! Oh, Linda, I can’t help laughing out loud about the shift lever! I know you cousin probably was furious with the dog, but I can see where that chunk of Onyx might have a similar appearance. I read that Onyx seems to go well with Tiger’s Eye. I’m eager to make myself something using Onyx, now that I’ve learned how helpful it is. And it’s supposed to look very striking when set in yellow gold (though I prefer the silver). Perhaps the setting isn’t as important as the stone. And you know, an Onyx necklace on a turquoise dress would be lovely, too! I know I need to make something with Onyx now! When I bought these beads, I really had no clue they did as much as healers say. The only way to test that out is to wear some and see for myself. Besides, they’re so beautiful that they’re sure to complement anything we wear! Debbie, that is so interesting. I had no idea about the origins of the word, so thank you for sharing that! I adore the color black, so Onyx has always been one of my favorite gemstones. My father also loved Onyx. In fact, he wore a square Onyx ring and never took it off. I don’t know what ever happened to that ring after he passed away, but I would love to have it as a memory of my father. I think I’ll ask my brother the next time I talk to him on the phone if he knows what happened to it. Thanks so much for sharing these very informative posts, my friend. I am really enjoying them. Don’t memories like the one you shared about your dad bring our loved ones home to us? I always remember my own dad’s college class ring. In his later years, he couldn’t wear it, but he kept it and we’ve still got it. Probably wouldn’t mean anything to somebody who’s not family (which is why I never understood anybody stealing a stranger’s jewelry!) Hope your brother knows what happened to the ring! I’m glad you’re enjoying this series, Ron. I’m learning so much myself, and I truly appreciate that we all can learn together! Something classy and understated about simple black beads! Onyx sounds like a gem that everyone needs to keep close at hand. I had no idea about all the gifts Onyx brings to us. These are really wonderful posts. Thank you. Aw, thanks for saying that! I didn’t know Onyx was such a good stone to have around either. And to think I’ve had these loose beads for weeks now, without trying to make them into something I can wear!! Aw, gee, you’re too kind! Thanks for the suggestion, Monica. Sadly, there’s no way I can keep all this info in my head, and who wants to pay somebody to read to them?! ?